Ammonium nitrate, NH4NO3, is a salt of ammonia and nitric acid that is highly soluble in water. Used as an inorganic fertilizer on lawns it is relatively inexpensive and makes nitrogen almost immediately available to plants. But the home gardener should know there are drawbacks as well as advantages to using it on lawns. Ammonium nitrate contains far more nitrogen than other lawn fertilizers. Nitrogen can make lawns a rich green and can increase their ability to recuperate from heavy use during the growing season. A shortage of nitrogen can cause lawns to grow slowly and thinly with a yellowing of the leaves. Too much nitrogen can cause a lawn to grow too fast, reducing the growth of roots and the reserves of carbohydrates that the plants need for nutrition. Too much nitrogen can also increase the lawns susceptibility to disease, drought and other environmental stress. 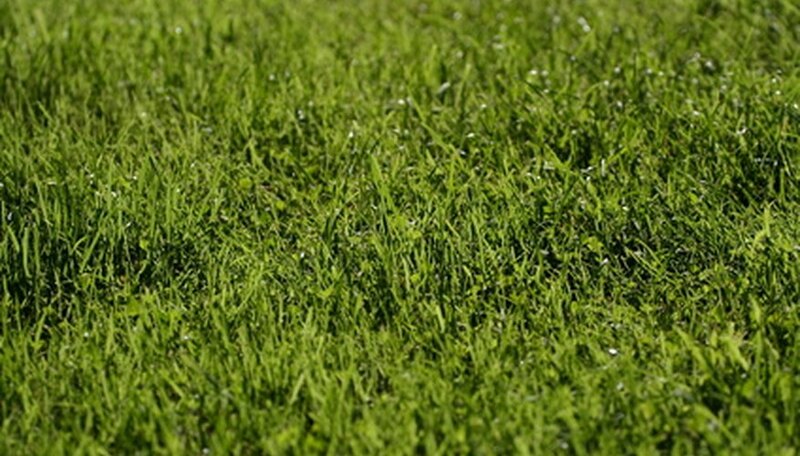 Ammonium nitrate can cause quick greening of grass in the spring, and it makes nitrogen available to grass when the soil is cold. Organic, slow release fertilizers that contain carbon are more expensive than ammonium nitrate. Microbes in the soil break down organic fertilizers, releasing nitrogen; this process takes more time than fast-release inorganic fertilizers. Slow-release organic fertilizers result in more uniform growth of grass, and they are less likely to be lost through leaching or evaporating. They may not work as well in cold soils. They will result in slower change in the color of grass, but they rarely cause grass burn. Slow-release fertilizers include sulfur-coated urea, activated sewage sludge, water insoluble nitrogen, IBDU (isobutylidene urea ). Ammonium nitrate and other fast-release fertilizers such as urea and ammonium sulfate should should be applied in smaller amounts and more frequently than slow-release fertilizer. Never wash ammonium nitrate fertilizer into the street or other areas where it can enter storm sewers. Clean sprayers and tools over your lawn so that they don't wash into drains and eventually into the ground water. If possible use a drop spreader rather an a rotary spreader. A drop spreader makes fertilizer slower to apply but the application is more precise.